We loved Castello di Velona! The complimentary champagne during check-in was a really nice touch. We stayed in the Terrace Suite with the private pool. The suite was absolutely fabulous, well appointed and very clean. The private pool terrace was truly something special. The views are phenomenal and the private hot springs pool really sets off the vibe. After checking in a getting situated we opted for a poolside meal at the Dolce Vita Pool Restaurant. The service was exceptional and we thoroughly enjoyed our fresh cold press juice and seafood salad. After spending a few hours driving through the local roads we came back and relaxed in the hot springs during sunset. The poolside service was great. We sipped champagne and had fresh fruit while we soaked in the magical sunset. Later that night we had dinner at Settimo Senso Restaurant. Again, the service was truly exceptional and the food was cooked to perfection. With dinner, we enjoyed a bottle of 2010 Brunello Di Montalcino. Magnifico! 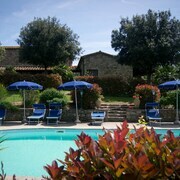 We really enjoyed our stay at Castello di Velona! Perfect retreat, perfect condition, perfect staff. Breakfast was all home made. Where to find Campagnatico hotels near an airport? Where can I find hotels in Campagnatico that are near tourist attractions? 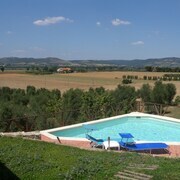 Are you visiting Grosseto and are looking for a hotel or apartment in or near Campagnatico? The middle of Campagnatico offers 8 hotels and apartments within a 0.1-kilometre (0.06-mile) distance. There are only a small number accommodation options within easy walking distance from the center of Campagnatico. 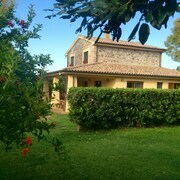 The Almatoscana B&B is a good option as it's just 3 kilometres (2 miles) away. The Castello Banfi - Il Borgo can be found 19 kilometres (12 miles) from downtown Campagnatico. 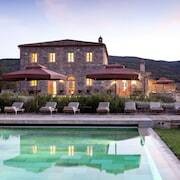 Alternatively, the Rosewood Castiglion del Bosco is 30 kilometres (18 miles) away. 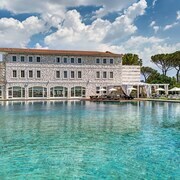 Another option is to book a bed at the Castello Di Vicarello or the Terme di Saturnia Spa & Golf Resort. 60 kilometres (38 miles) away from Campagnatico you will find Giglio Porto, home to the Giglio Harbour and Max Shark Diving. 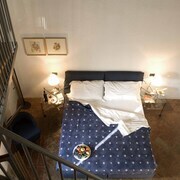 Some of our recommended Giglio Porto accommodation options are the Ammiraglio and Hotel L'Arenella. Alternatively, you could stay in Punta Ala, 40 kilometres (25 miles) to the west of Campagnatico, where you can pick from the Gallia Palace Hotel and Baglioni Hotel Cala del Porto. The Punta Ala Marina and Bagno Punta Hidalgo are just a couple of the more popular attractions to see when you're in Punta Ala.
Before your Campagnatico trip comes to an end, why not spend an hour or two hanging out with local sports obsessives at a local game. Stadio Artemio Franchi - Montepaschi Arena is 50 kilometres (33 miles) to the north of Campagnatico. Stay right near the action at the Grand Hotel Continental Siena – Starhotels Collezione or the Hotel Certosa Di Maggiano. For those travelers planning on arriving through Peretola Airport, you can book a room at The St. Regis Florence, or The Westin Excelsior, Florence, both of which are nearby. What are the most popular Campagnatico hotels? Are there hotels in other cities near Campagnatico? What other types of accommodations are available in Campagnatico? Explore Campagnatico with Expedia.ca’s Travel Guides to find the best flights, cars, holiday packages and more!